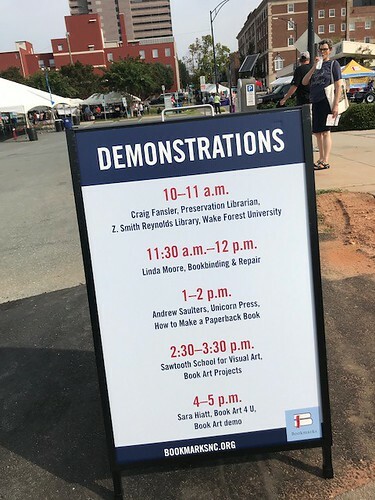 Bookmarks sponsored a series of book arts-related demonstrations at their Festival this past weekend, and I was happy be invited to participate. No one was protesting at the Bookmarks Festival this weekend. There were a series of demonstrations related to books, however, which I was privileged to be part of. Tipping-in: The most simple technique is called tipping-in a loose page. This technique involves gluing a loose page or several pages into a book using a small amount of polyvinyl acetate adhesive (PVA). Mending paper tears with heat-set tissue: Heat-set tissue is a thin tissue with a heat activated adhesive on one side. It is used to repair paper tears or for backing a fragile object. By adhering a thin strip of the tissue over a tear and using an iron or a tack iron, the tissue is adhered to the page. Tearing and using Japanese paper: Japanese tissue is a term that includes many hand-made papers from Japan (eg. I use Sekishu paper). It can be torn along the grain and used to repair broken joints (hinges) in a book. The paper is thin and flexible, but strong. Spine Replacement: In the event a book’s spine is torn and damaged, a new spine piece can be created. This allows the book to be used for many years into the future. Using bookcloth or buckram, a replacement spine can be created and glued into the book. The repair is then completed by placing the book in a press. Paperback Repair: Most paperbacks are made much like a memo pad- loose pages are glued along an edge. Over time, the adhesive can fail to hold the pages together. A simple repair is to remove the cover, re-glue the pages and then glue these pages back into the book. End-sheet replacement: A good method for re-attaching loose book covers it to glue down new end-sheets. A piece of heavy-weight paper is glued onto the covers of the book on the inside. This will re-attach the cover to the text block of the book making it strong enough to function. The goal of these demonstrations was to show the audience how they could better take care of their own collections. The Bookmarks Festival always has a good crowd and it was a great experience. Craig, I always think it is wonderful how you share your expertise! It was fun seeing you across the way at Bookmarks last weekend! Wow, lots of demos! Good work educating the people about who books are made, and repaired. Why would there be protests? People don’t like books?